A grand opening ribbon-cutting was held Monday morning at the new “Blue: Second-hand Fashions for Her” boutique in Washington Court House. Featuring trendy and many name-brand fashions for women, it’s the first of its kind in the lineup of stores in the eight-county territory of Goodwill Industries of South Central Ohio. Blue is located at 1377 Leesburg Ave., across from the entrance to the Fayette County Fairgrounds. Pictured at the ribbon-cutting are: Fayette Chamber of Commerce President Whitney Gentry, Mekia Rhoades, Goodwill Executive Director Marvin Jones, WCH Goodwill manager Toni Copas, assistant manager Bethany Ogden, Goodwill Retail Coordinator Jerrod DePugh, Colleen Roundhouse, Goodwill Marketing Coordinator Joe Parker, Julie Bolender, Kathy Patterson, and Ruth Ann Ruth. 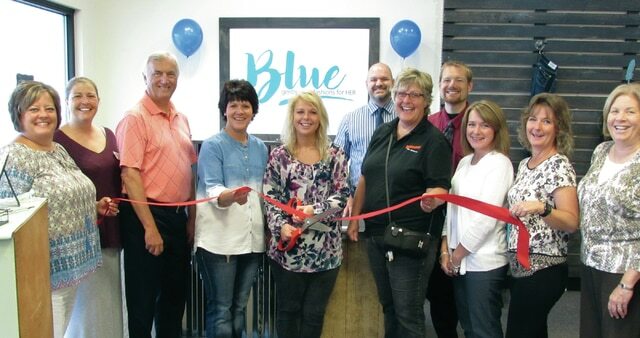 https://www.recordherald.com/wp-content/uploads/sites/27/2016/08/web1_Blue-opens.jpgA grand opening ribbon-cutting was held Monday morning at the new “Blue: Second-hand Fashions for Her” boutique in Washington Court House. Featuring trendy and many name-brand fashions for women, it’s the first of its kind in the lineup of stores in the eight-county territory of Goodwill Industries of South Central Ohio. Blue is located at 1377 Leesburg Ave., across from the entrance to the Fayette County Fairgrounds. Pictured at the ribbon-cutting are: Fayette Chamber of Commerce President Whitney Gentry, Mekia Rhoades, Goodwill Executive Director Marvin Jones, WCH Goodwill manager Toni Copas, assistant manager Bethany Ogden, Goodwill Retail Coordinator Jerrod DePugh, Colleen Roundhouse, Goodwill Marketing Coordinator Joe Parker, Julie Bolender, Kathy Patterson, and Ruth Ann Ruth.